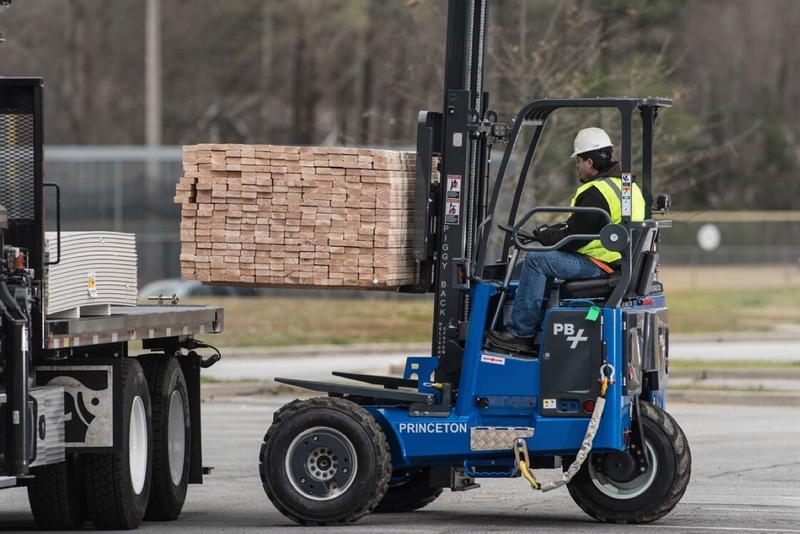 Princeton’s PiggyBack® Forklift has become a field-proven favorite for delivering lumber and lumber products that has revolutionized both customer service and delivery efficiency. The Princeton PiggyBack® Truck-Mounted Forklift is a proven method for delivery of OSB, engineered wood, and stick lumber products. Historically, materials were delivered to the edge of a site by a dump bed truck or truck-mounted crane. The customer then had to move the materials again to wherever the work was being done. The PiggyBack® truck-mounted forklift enables your driver to spot-deliver materials precisely where your customer wants them, faster and easier, on virtually any work site with unmatched stability. A PiggyBack® can increase efficiency, not only by eliminating costly double-handling, but also by reducing delivery related product damage. It also is invaluable for pickups or for correcting misplacement of products on the job site. PiggyBacks are available in many, different models with a wide range of available lift heights...capacities up to 8,000 lb... and other, special features that allow it to be configured to your specific delivery requirements. All PiggyBacks mount in less than a minute behind virtually any truck or trailer for easy transport to and from the job site. If you currently use a tow-behind or trailered forklifts, you already recognize the benefits of having a portable unloading unit with your delivery vehicle. The Princeton PiggyBack® Truck-Mounted Forklift provides all these benefits in a highly efficient package that eliminates the complications of towed vehicles. Princeton offers models tailored towards the demanding needs of the lumber industry.